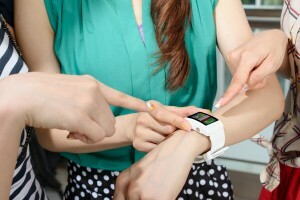 How Will Wearable Technology Impact the HR Process? At first glance, it’s easy to see wearable technology like smartwatches, smart glasses, and physiological monitors as simple extensions of the smart mobile devices that already pervade the modern office. However, I think things are going to be different this time: when smartphones first came around, they were — let’s face it — not fit for their purpose and a little arcane. Because of this, adoption was slow and steady, and it was only as smartphones became perfected in perhaps the last 3-5 years that usage grew exponentially. I don’t think that wearable technology’s entry into the market will be any where near as sedate as the arrival of smartphones, because the market is primed for new “smart” technologies this time around. Take this article from Inc., which cites Juniper Research data that predicts that wearable technology will effectively go nuclear, with market size expected to leap from $1.6 billion today to $19 billion in 2018. That’s 1,000 percent market growth in four years, meaning that wearable tech will explode into the workplace and HR sphere like nothing any HR professional has seen before. So what? What will be the impact on the HR process? Well, what really got me thinking about this was a futuristic character from a Back-to-the-Future-type cop TV show, who has a camera/recording chip put in her head by the police (it’s standard issue in this time!). This automatically records every thing she sees and it can be used as photographic or video evidence in the court of law, transforming police testimony and the conviction process. and employees asking to wear Google Glass in formal HR meetings rather than taking notes. While there is no need to panic, it should be noted that neither society nor the workplace has established etiquette, boundaries, or rules for how devices like Google Glass should and shouldn’t be used. This is understandable, as wearable technology is just entering the market. However, with wearables set to really explode over the next few years, I think now is the time for HR practitioners to start developing clear policies regarding wearable technologies.